https://www.humblebundle.com/ I still have my Dreamcast games, but not the bass pro fishing. I'll have to use a controller instead of the original fishing rod controller, but I'll still enjoy it. lol. I hope Sonic Adventure 2 DX is added next week. I have both Sonic Adventure games on my Dreamcast, but those games had online properties to them. But these DX versions have all the online content since my Dreamcast won't be making a connection to Sega's servers anymore. I haven't been able to enjoy a good karting game in years since I don't buy Nintendo consoles, maybe Sonic racing will be decent. https://www.humblebundle.com/weekly I wouldn't mind playing Altered Beast or the old Golden Axe games, but I'm a bit disappointed there isn't any Sonic games in this bundle. 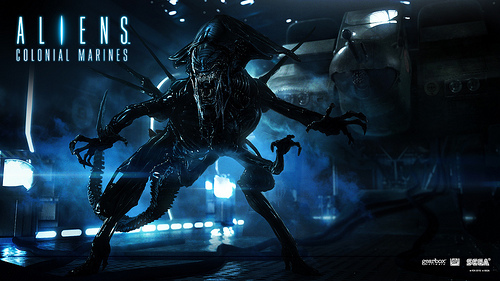 Aliens: Colonial Marines arrives next month.